Healthier ways to take the edge off — when a glass of wine isn't an option. "I need a drink" has been my auto-reply to virtually all stressful occurrences in my day-to-day life for about as long as I've been an adult. To be honest, I can't pinpoint the exact moment I started chasing stress with alcohol. But somewhere during the past decade, relieving college midterm stress with Bacardi Razz bled into post-awful-day-at-work happy hours and finally, morphed into my current Friday night tradition: holing up in my apartment with a bottle of wine to myself in an effort to unwind from a long work week. And my weekly de-stressing regimen isn't completely off base, alcohol does work as a catalyst — at least in the short term. “Alcohol acts as a depressant on the central nervous system, which leads to a number of immediate, noticeable effects," explains clinical psychologist Dr. Lauren Wolfe. "It slows your heart rate and breathing, which can result in a relaxed sensation. We tend to lose our inhibitions when we drink, which decreases our worries and fears." Over five million women in the United States drink in a way that threatens their health, safety and general well-being. As for the magic number of drinks that allow you to reap these stress-relieving benefits without the negative effects, Dr. Wolfe says it varies from person to person based on factors like our body weight and metabolism. But somewhere past a few drinks, treating stress with alcohol does become detrimental. “When our blood alcohol content increases, we become emotional — or more emotionally unstable — as we experience impairments to memory and comprehension," Dr. Wolfe explains. "This makes managing stress while intoxicated even more challenging than it already is when we are clear-headed." According to the National Institute on Alcohol Abuse and Alcoholism, it's estimated that 5.3 million women in the United States "drink in a way that threatens their health, safety and general well-being." Meaning, they're frequently well over the CDC's recommended limit of one drink per day — which shakes out to either 12 ounces of beer, 5 ounces of wine or 8 ounces of malt alcohol. Suffice it to say, being a stressed out woman who drowns her feelings in alcohol is not unique. In fact, a trip to any women's clothing store will make you feel like the habit actually earns you street cred. From t-shirts that define wine as a "hug in a glass" to graphic tees with pictures of multiple cocktails dubbed "group therapy" to one I came across recently that straight up stated "adulting requires alcohol," managing stress by knocking back a few cold ones is not only considered the norm for women — it's celebrated. So when I spent a month doing the Whole 30 diet and cutting out everything processed from the menu — yes, alcohol included — you can bet I was met with groans from my girlfriends. (Not to mention, fewer wardrobe options.) But I did learn some valuable things about de-stressing without the help of a drink. Here are a few of the activities I replaced my glass of wine with during my 30-day detox that helped take the edge off my stress levels. Bear with me here, because I know this one sounds like something out of a cheesy self-help book. When stuff hits the fan at work, my automatic reaction is to first take to Gchat, complain to whoever's online and start making happy hour plans. Second, I pay a visit to the office candy bowl. Both of those options were off the table when a last minute deadline sprung up on me during the first week of clean eating and sobriety. Out of habit, I still sent out a flurry of angry "I NEED A DRINK" chats, and got halfway to the office candy bowl before realizing that I couldn't have anything from it. Since I was already in motion, I decided to keep walking, head outside and do the whole "clear your head" thing. And it worked. To decompress after a few particularly challenging work days, I walked from my office in New York City home to Queens. Crossing the Queensboro gave me something to focus on without being able to completely check out (bridge bikers are fearless and don't yield), which meant I couldn't fully let my mind wander to the thing that was stressing me out in the first place, and instead had to pay attention to my surroundings — both the rogue bikers and the scenic views of the city skyline. As a single cat mom, I do my best to spend as much time with my cat Nightmare as possible — especially since it's just the two of us living together. But not being home as often as I'd like to be for her does contribute to my stress levels, to the point where I feel guilty staying out late at a happy hour when I know she's at home waiting for me. Research shows that playing with and petting animals decreases the production of cortisol. My sober month not only afforded me more time with my cat, but our playtime together started to feel almost therapeutic — so much so that I made it a priority to come home and spend at least thirty minutes every night unwinding by winding Nightmare up with her favorite toys. “Research has shown that playing with and petting animals decreases stress for the same reasons exercise does: It decreases the production of stress hormones (e.g. cortisol) and increases the production of stress-reducing hormones (e.g. oxytocin)," explains Wolfe. “The heart of any stress-reducing regimen should be increasing the production of oxytocin and decreasing the production of cortisol. Alcohol doesn’t do this, but taking a break, getting good exercise and playing with pets are activities that do." When I'm not de-stressing at the bar, I'm usually doing so on my couch with a glass of wine in one hand and my remote in the other. The first time I sat down to do this sober, I found myself grabbing for my glass of wine where it usually sits in front of me out of habit. (Which was as sad as I'm making it sound.) While my usual pairing of wine and chick-flicks was hard to break at first, actually engaging with the story line (and not having to drunkenly rewind every other scene in order to follow along) was more helpful in allowing me to de-stress. “Distracting yourself with a book can be a great way to relieve stress because it keeps your brain engaged and active, whereas watching TV is more passive," Wolfe explains. "But either way, some people find that engaging with the narrative of a film or book can help them relax." When a week of relentless deadlines had me at what felt like my breaking point, I bought a ticket to a Broadway musical I had been wanting to see. Spending two hours away from reality left me feeling ready to take on whatever chaos I was about to walk into come the next morning. Meditation and I have a rocky relationship and to be honest, the idea of sitting in silence with my thoughts or worse, having someone guide me through some weird visualization process, was not in the sober cards for me. But the further I got into my 30 days without alcohol (and the more the hits just kept on coming at work), the more I found myself taking deep breaths in and out at my desk in order to deal. Taking deep, deliberate breaths is one of the best antidotes to the body’s natural response to stress. “Taking deep, deliberate breaths is one of the best antidotes to the body’s natural response to stressful situations — and since your breath is with you wherever you go, it’s a way you can help your body relax in moments of stress anywhere, anytime," says Wolfe. "Stress triggers the hormones cortisol and adrenaline, which in turn produce the rapid, shallow breathing you associate with the ‘fight or flight’ response. Taking slow, full breaths disrupts the secretion of stress-inducing hormones and helps you feel calmer." Whenever I had a full hour to dedicate to working out, I hit the bags rather than the bar. I had to replace my boozy post-work plans with some type of activity, and exercise seemed like the most obvious choice while I was on this whole treating-my-body-like-a-temple kick. Granted, it wasn't as easy as opening up a bottle of wine, but it did get the job done. “Aerobic exercise is not just good for your heart, it's good for your head," Wolfe explains. "Exercise reduces the stress hormones in the body, such as cortisol and adrenaline, and it simultaneously produces endorphins, a neurochemical that acts as a mood booster and natural painkiller. Studies show that even brief amounts of physical activity can have really positive effects on stress, but you’ll have the highest impact by making exercise a regular part of your life. There’s no magic amount of exercise that works for everyone — what works is finding a type and amount of exercise you can commit to." Even before I laid off the sauce, my workout of choice had been boxing, so whenever I had a full hour to dedicate to working out, I hit the bags rather than the bar. But surprisingly, it was the short morning workouts that I squeezed in before work that I found really set the tone for my day, and allowed me to walk into my office without feeling like a ball of stress — that, and the fact that I wasn't extremely hungover. “When trying to manage your stress through exercise rather than alcohol, the most important thing is to set goals that are achievable and practical for your schedule," says Wolfe. "It’s much better to say you’ll exercise 20 minutes, two days per week and actually stick to it, than to set a goal that is unattainable, making you feel defeated." 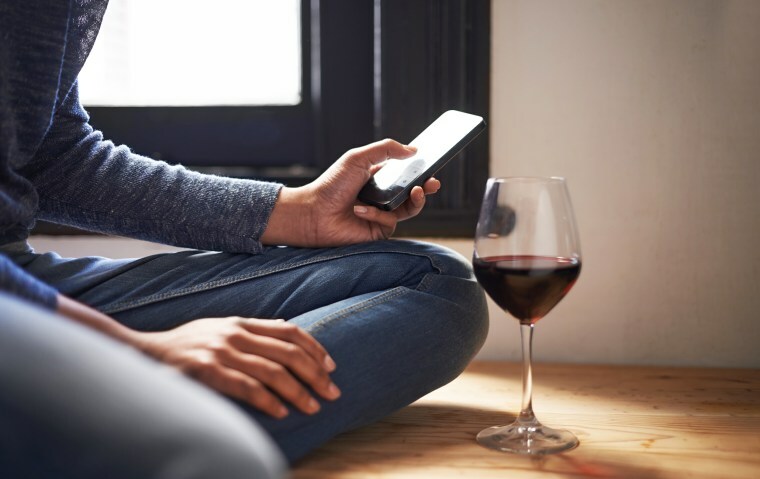 "Instead of having a drink when you are feeling stressed and overwhelmed, it may be helpful to find more substantive ways of being connected," says David Klow, a license marriage and family therapist practicing in Illinois. "Often isolation, or a sense of being disconnected, leads people to feel stressed or overwhelmed. If there is not someone or something else to turn to, we reach for a quick fix, such as a drink. Instead, a more impactful way to manage stress is to be sure that you are connected. Recognizing that you are not alone, and that there are others in this world who can support you, goes a long way to get stress out by the roots." Don't get me wrong, there are plenty of instances where I use drinking alone as a stress management tool. But spending time with my friends throughout these 30 days made me realize that the reason why I always leave our meet ups feeling better and not so wound up isn't as much about the vodka-soda as it is the fact that I feel less alone about whatever's stressing me out after talking with supportive friends who are always willing to lend an ear. Did I add the wine back into my routine? Well, yes. But I do hit the gym harder than I hit the bottle these days — especially during stressful weeks. And my cat and I are both happier for it.